First presented in Glasgow, subsequently at the greenwich Theatre, London and then adapted for TV this comedy became a deserved classic. The Garrick are offering you the chance to spend Hogmanay (sometime in the 1950s) with Doreen, Magrit, Dolly and the wonderful Mrs Culfeathers, to say nothing of the easily manipulated Andy the odd-job man. Set in an old Glasgow steamie we listen in on the women’s chatter and the gossip. We share their hopes and fears; their dreams, laughter and tears complete with wonderful songs and above all – the enigma that is Galloway’s mince. Most of us may live in centrally heated houses with all mod cons but are we really happier than our parents and grandparents were? 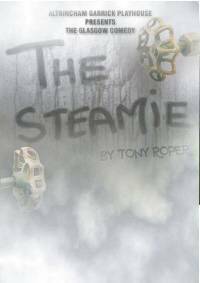 While it is foolish to look at the past, that is the question posed by Tony Roper in?The Steamie, an award winning comedy with a huge heart. On the one hand, Altrincham Garrick's latest production is a right good laugh, but on the other, it's a play about the death of community. The youngest character who frequents the Glasgow laundry is already dreaming of a house in suburbia, packed with labour saving devices which we now take for granted but were still considered luxuries for many working people in the 1950s. But "the steamie" of the title is more than just a place to wash clothes. It's an unofficial social club, and we see the exclusively female customers laugh together, cry together and dream. They keep reminding us that in those new fangled laundrettes nobody passes the time of day. Director Brian Tickle's production is beautifully paced and brimming with affection and in Janet Slade, Jeryl Whitelock, Val Bacon, Stephanie Hawthorn and Matt Goddard he has a fabulous cast. Unmissable.